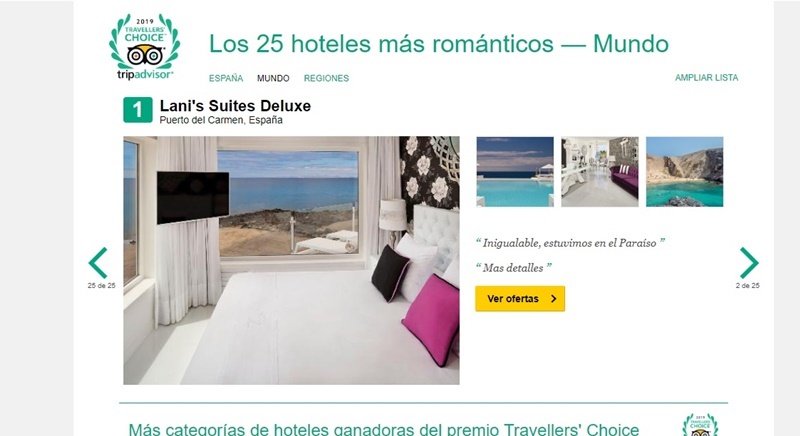 The Lani’s Suites de Luxe hotel in Puerto del Carmen (Lanzarote), which had already been awarded, in previous editions, as the most romantic hotel in Spain in the annual awards given by the TripAdvisor website, based on the opinions of its users, has been awarded this year as the “most romantic in the world 2019” according to the same website, as well as in the categories Customer service, in second place and small hotel, in fourth place. It is the fourth consecutive year that the Lani’s Suites de Luxe receives this award for ‘best romantic hotel’, in different categories, recognition that supports the bet that has made the businessman Kumar Dadlani, to completely renew the establishment in 2015. According to the website of this complete hotelier, Lani’s Suites de Luxe has “25 Suites designed to elevate our most exclusive clients to our little piece of heaven”.